EPS estimates are always in the practice of falling over time, so that natural process should be considered when comparing across the movement of the calendar. 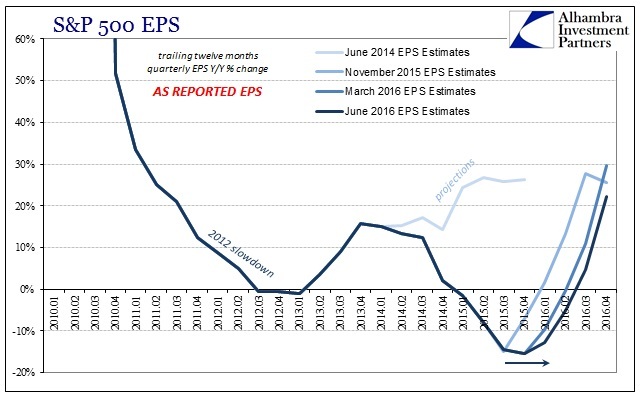 That said, however, earnings continue to defy projections of a rebound. This is not to say that analysts aren’t expecting one, only that the expectation keeps pushing further out in time. According to Howard Silverblatt’s figures from Standard & Poor’s, as late as November analysts were projecting $27.71 in quarterly earnings (as reported) for Q4 2015 and $27.60 for Q1 2016. Those represented significant year-over-year gains (+21% and +27%, respectively) from the weakness that ended 2014 and began 2015, all figured to be transitory. With 98% of the 500 companies having reported their first quarter 2016 results now, those November expectations were entirely upended. 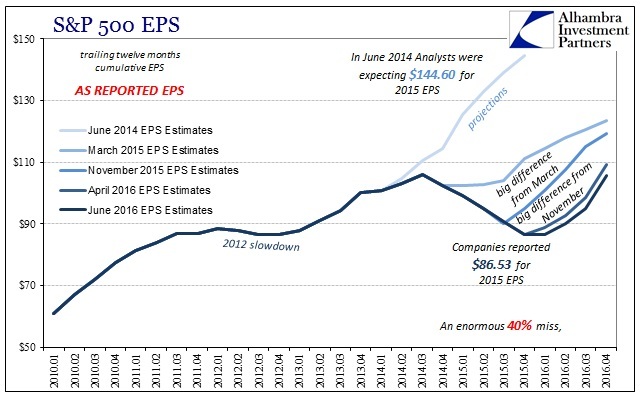 EPS in Q4 was only $18.70, a third less than anticipated while the quarter was in progress. First quarter EPS will settle somewhere close to its current number of $21.72, a fifth less than what was hoped just over six months ago. That has had the effect of flattening out the earnings trajectory that still points toward the sky, but only further down the y-axis. That has been the effect of the (so far) liquidation waves, with what I just described since November the direct result of the last of them in January/early February. Analysts project the resumption of skyward earnings growth time and again only to be interrupted by “global turmoil” each time. We can reasonably assume something similar should another erupt at some point before the 45 degree ascension is actually reached. That means the real problem is valuations. There is always a significant amount of generalization when characterizing the entire market via its assumed and calculated price-to-earnings ratio, so some care is warranted. In the case of the current market, there is no debate that the energy sector is a driving force in the earnings collapse, but in more recent quarters it has not been alone in taking down the fundamental foundation for stocks. In Q1, energy sector EPS rebounded sharply year-over-year, though the 176% gain is overstating it because of the low base after being beaten down so far up to this point. EPS in the industrials sector was also up in similar fashion. Earnings in the materials sectors continued to get pounded, however, while utility EPS fell for the third straight quarter and IT for its fourth. Telecomm services earnings gained a mere 0.4% in the first quarter, after five straight declines cumulatively large in magnitude. The result is where analysts in November were expecting $100.85 in trailing-twelve-month EPS in Q1 rising to $119.45 by the end of this year, they now expect only $86.44 through Q1 and just $105.77 for 2016. 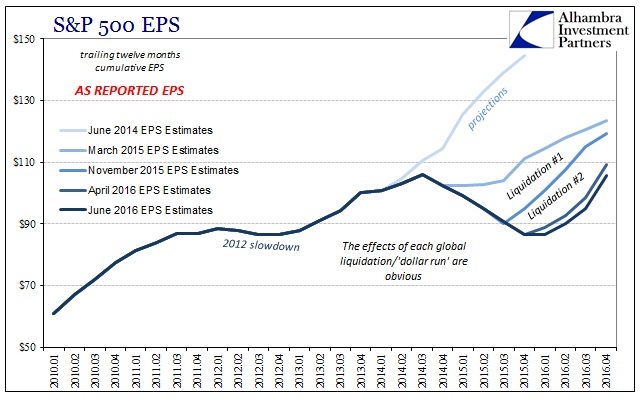 Not only is that an 11.5% reduction in earnings, it places the intended path of fundamental restoration for legitimate valuations that much further into the future – thus, that much more in doubt, further liquidations or not. 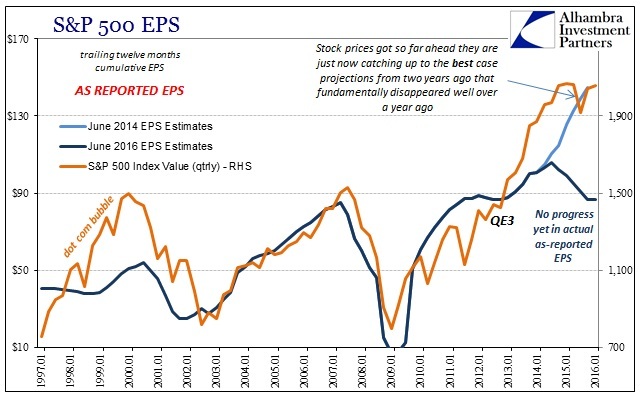 At a constant 15 times EPS multiple, November’s forward earnings would have equated to a “fair value” of just less than 1,800 for the S&P 500 as an index; to about where it fell during August and February’s lurches. 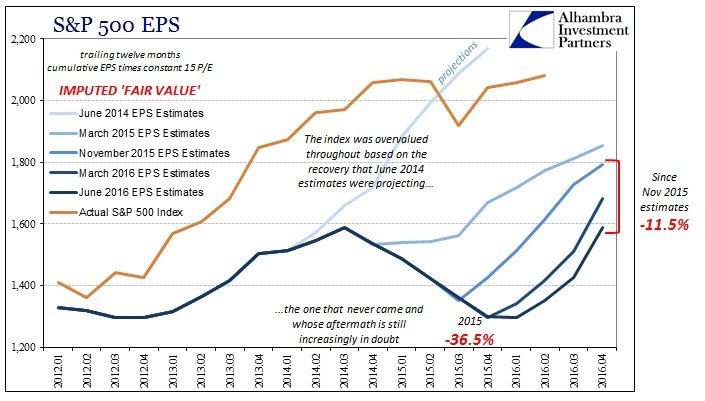 Pushing the EPS recovery further into the future has had the effect of, again, reducing 2016 earnings by almost 12% and thus forward “fair value” to only about 1,586. In other words, a great deal more uncertainty in terms of valuations for a market already quite overvalued. Despite the extreme reduction in reported earnings, the market during the “rising dollar” has largely moved sideways. As you can see below, it does so in seeming anticipation of “transitory”; that the EPS trajectory that was thought solid and unbent in June 2014 will be at some point in the future provided by the expected full retracement and recovery. The market appears to be waiting for earnings to “correct” rather than prices. Instead, as EPS lingers farther and farther below that level, the risk of further fundamental revaluation in price has to rise. That is a consideration in its own right, but more so given the state of global “dollar” liquidity and the tendency toward repeated liquidations.